GitHub - zephray/VerilogBoy: A Pi emulating a GameBoy sounds cheap. What about an FPGA? Want to be notified of new releases in zephray/VerilogBoy? Coding for fun - the hard way. Trying to implement a Game Boy® compatible machine with Verilog. Both are hosted in this repository. There are three major parts needs to be implemented: the Game Boy CPU (8-bit CISC Processor called SM83, Intel 8080 like), the PPU (Pixel Processing Unit), and the sound unit (sometimes referred as a PSG, Programmable Sound Generator). Several interfacing modules are needed to support the IO capability provided by the specific hardware (FPGA development board or "VerilogBoy Handheld"). Current Pano Logic G1 is the only supported platform. ML505 and VBH support are planned. Refactoring in progress. Current version could run several commerical games with no noticable glitch on the Pano Logic G1 device. 'Master' branch contains the previous version that runs on the ML505. Next step would be improving the accuracy. For progress regarding different ports, view README.md under the specific target folder. This project is not built to be entirely accurate, but built with accuracy in mind. Most of the CPU timing should follow the original DMG-CPU, and implement a rudimentary 2-stage pipelining just as the original one does. Here are the results of several tests I have tried to run on it. Note: Tests which depends on the revision / model of GameBoy are omitted. VerilogBoy only focus on behaviors that are common among all monochrome GameBoys (GS). Notes: other tests hasn't been tried. Note: things that will be removed in the near future may not shown here. Not all source files are shown here. Tested environment: Ubuntu 18.04.2 LTS. --testmode: Disable internal Boot ROM, headless mode, limit cycles to 32K. --noboot: Disable internal Boot ROM, code execution starts at 0x0000 rather than 0x0100. See README inside target directory. 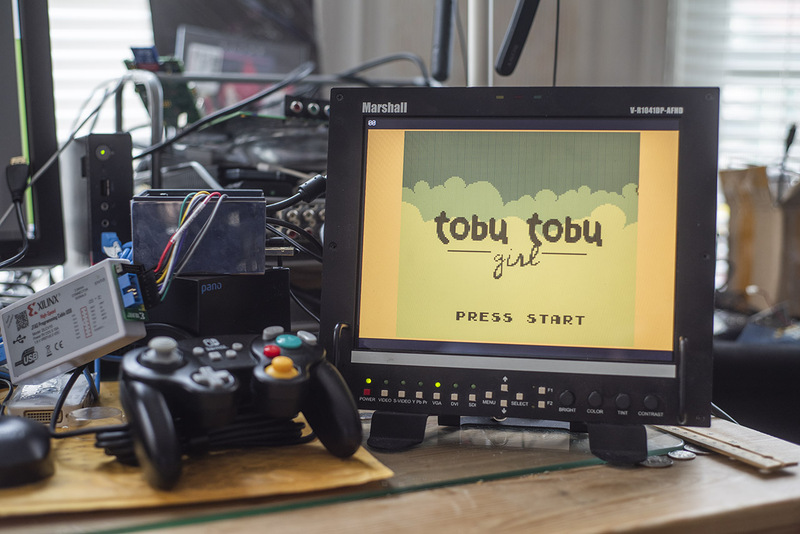 VerilogBoy Handheld is an open source FPGA-based handheld game console. All design sources of the VerilogBoy Handheld are hosted in this repository. Note: the architecture is subject to change. This project reused codes from several other projects. A great thanks to their efforts! These projects are used as references. Again, thanks for sharing. I'm not affiliated with Nintendo in any way. Game Boy® is a registered trademark by Nintendo. Nintendo® is a registered trademark. All other trademarks are property of their respective owner. The dsicore is made by twlostow, released under LGPL 3.0. The PicoRV32 is free and open hardware licensed under the ISC license (a license that is similar in terms to the MIT license or the 2-clause BSD license). Some firmware code of pano-g1 target are released to public domain. All other software codes are licensed under GNU GPL 2.0. All other HDL codes are licensed under OHDL 1.0.